No that is not the issue. Core count does not affect solution stability. The decomposition algorithms are quite robust and only give negligible result errors, not instability in the solution. This is one of those times where a Slack or Discord chat would be great. Yes we did mention about it. I use slack and wouldn’t mind joining one. Maybe @jousefm can start one? I’m not sure I like Slack for this kind of thing. The beauty of a forum is that the posts persist, are editable and searchable, and the conversation stays (mostly) on one topic. I find important information gets lost in Slack conversations as posts move up the infinite scroll. Other users won’t be able to benefit from the conversation either. Not to mention it’s super distracting. I agree with you in general terms but I just joined that new Powerusers Slack (and never used Slack before). Slack is good for figuring out what everybody wants for lunch. May be a bit early to tell, but it looks like disabling potentialfoam made a big difference. @jhartung looks like you are making progress. While potentialFoam is great for reaching convergence, it can cause a few issues of its own. Looks like pitch and roll moments will take quite a bit longer to stabilize, may have to think about trying the ‘Continue the run’ feature (but won’t take many more core hours for long runs at these settings ) unless you see another issue here??? Yes, with less than 500 core-hours left I’ve been pondering this. I think it’s time to be an engineer about the problem. My goal is to understand the lateral stability in the airframe with a variety of nose lengths. 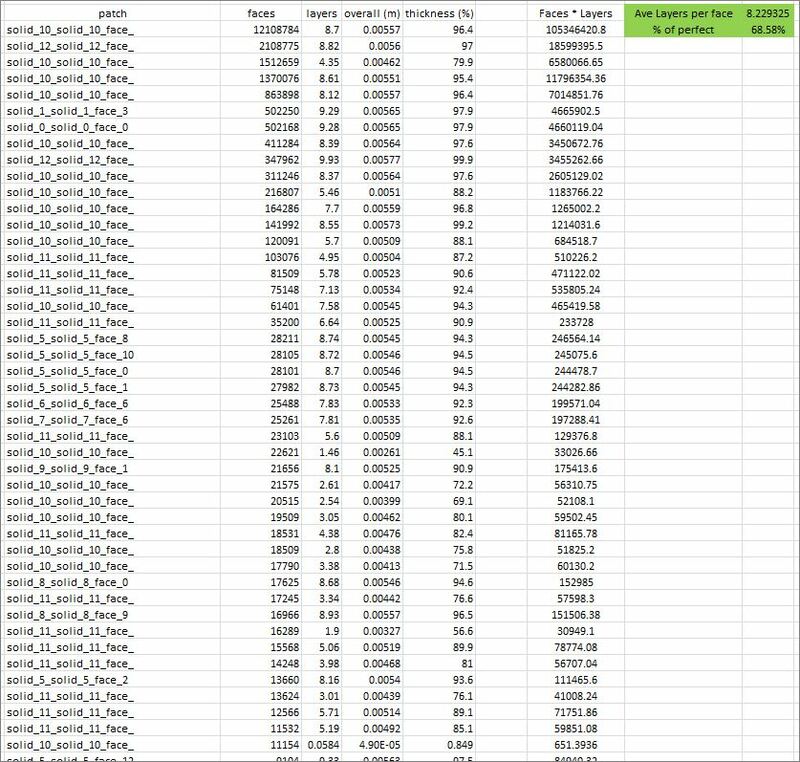 Looking back on all my simulations, yawing moment has been consistent regardless of all my BL or mesh density shenanigans: around 2800 N-m about my measurement datum. Pitching and rolling moments vary wildly though, so I’m not going to trust those until I do more. On the positive side I’m getting closer to a full resolution mesh! That is very nice, how many cells? Sorry, spoke too soon, did not notice your Y+ scale. I think this is Run 22 more pertinent Y+ map scaling and it is very confusing to me, did I do it wrong? Glad that work. I’ll have to thank @1318980 for this suggestion way way back then. 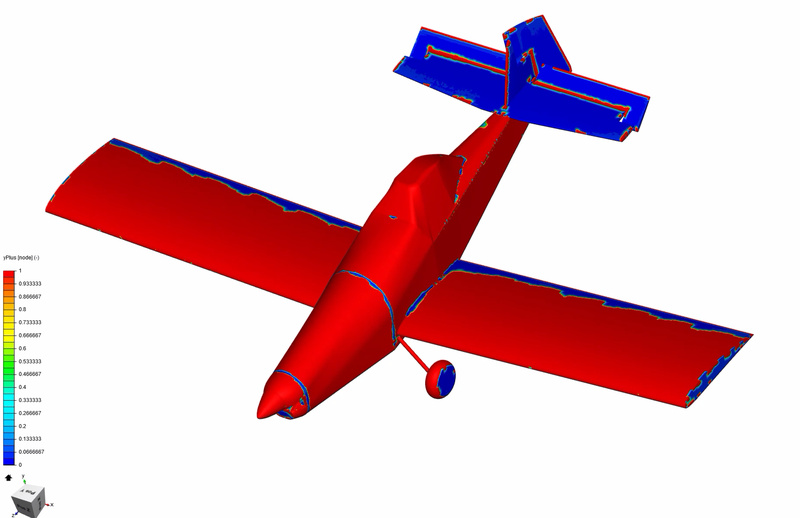 I looked into the ‘body check errors’ more on the geometry we are working with, when I remove the spinner and nose cowl from the plane and re-import that, the ‘body check errors’ disappear. But the ‘geometry is watertight’ message disappears when I do this. 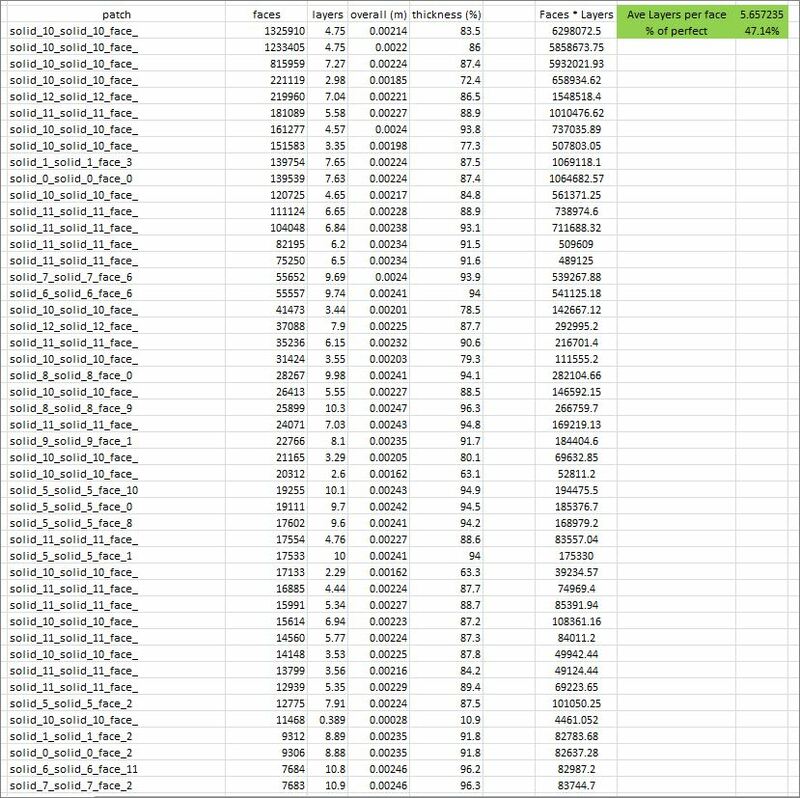 I also had a look at the layering parameters I calculate to determine how good a layering is , using data which I obtain from the the meshing log table. I was hoping you were using that metric in your cat and mouse efforts. I calculate ‘Average Layers per Face’ and dividing that by the ideal # of layers requested I calculate ‘% of perfect’. I think it is time for a MK4 project , start with geometry that has no ‘body check errors’ and is watertight. Yes, with less than 500 core-hours left I’ve been pondering this. I think it’s time to be an engineer about the problem. I see I may have created a monster here. While it is amazing you are striving for a pure y^+ < 1 mesh, please remember that this only matters for areas where determining the the separation point is absolutely critical. 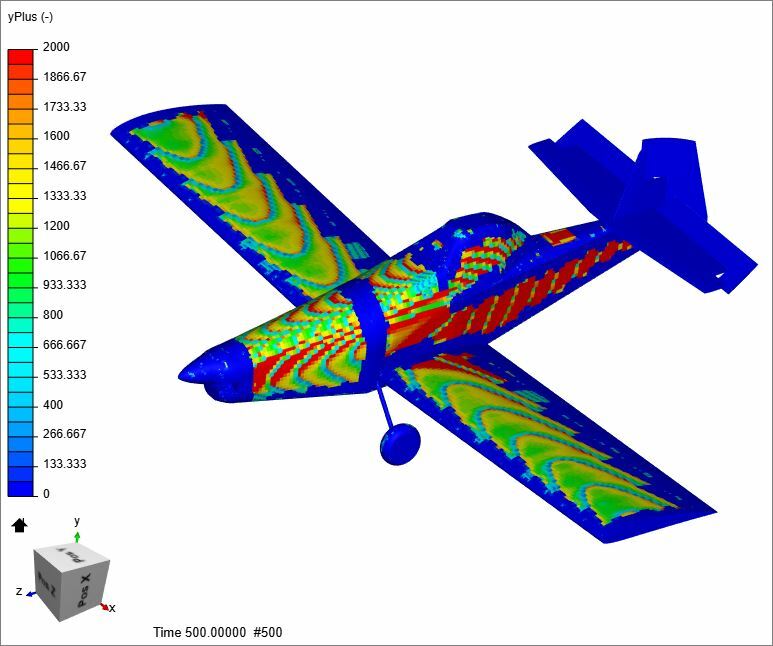 For example, a NACA 0012 at flat and level has no flow separation and therefore you don’t need such a strict y^+; however, if you wanted to find the exact stall point by doing successive simulations then the separation is critical and y^+ \leq 1 is absolutely necessary. I’m guessing for the majority of your plane that a higher y^+ will be adequate but areas that are really important to separation should be refined. Does that make sense? Yes, but I assume that the wing will have separated well in front of the trailing edge and that the side of the fuselage will have separated somewhere and both of those areas are not anywhere near Y+=1. (in fact Y+ seems to be measured in the 1000’s there). I think both areas mentioned will surely have an effect on rudder blanketing.